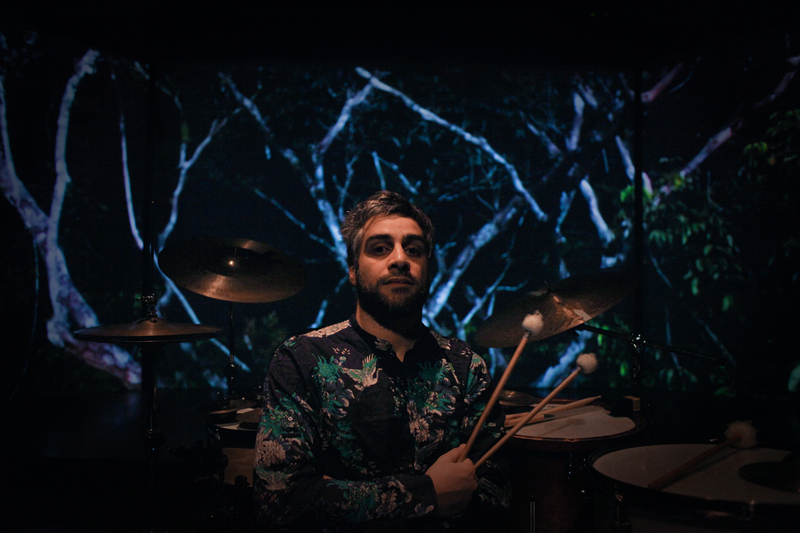 Uriel Barthélémi is a drummer, composer and electro-acoustic musician. Following his studies at the conservatoires of Reims, La Courneuve, Montreuil and Ircam, he embarked upon electro-acoustic compositional work. This has led him to collaborate in numerous areas of the performing arts from 2002 onwards: dance, puppetry, theater, as well as the visual arts. In parallel with his compositional work, he performs as a drummer for several projects and conducts research into drum and computer connections, developing his own software in Max-Msp. These multiple themes have made him reflect upon the concepts of performance and improvisation, to take into account the concepts of plasticity and physicality of sound through spatial layout, as well as question the place of the performer (movements, energy, corporeality) and psychological contexts (intentions, cinematographic colors, sonic staging, and so on). You studied at conservatories and music institutions. Can you talk about how music education influenced you and how relevant classical music education is in experimental music nowadays? I studied at conservatories for a long time: double bass, drums, jazz, electro-acoustics and theory. Of course it influenced me a lot in how I play, analyze and build music. But still, I don’t think real substance in music can be taught in such places. You can learn how to use the tools, but not what you have to say. This is maybe the biggest difference between a more traditional way of doing music and electronic music nowadays. The tools got much faster, easier to understand and practise with, but you still have to do the work. And also, in sound, you can hear the difference between someone who is doing things quickly, using presets, and someone who is deep into his or her research. Classical music education might perhaps help some musicians in furthering the harmonic field, and in the structures of a composition. You also develop your own software and research drum and computer connections. I’ve been doing this for more than 12 years now. I’ve built some specific delays, reverbs, ring mods for the drums, for example. In the beginning, I was looking more for complex effects – granulars and delays – but over time, I arrived at simpler tools that I can use live while playing the drums. It’s impossible for me to be trapped behind the screen. Now I’m using these effects for improvised sessions or to build specific textures that I’m reworking later. I’m also developing some kind of analytical tool to enable the use of the data produced by the drums to feed the electronics, whether for sound or video interactions. The idea is to have tools that I can play as extensions of the drums. So there will be sounds that complete the spectrum of the drums and also that give me some real responses when playing with the help of Euroracks and modern analogue synths. Many people see drumming as something primordial, wild and full of energy, while computer music-making is considered to be cerebral and nerdy. How do you connect the two, especially in improvisation? There is an infinity of drumming styles; drumming can be wild and violent but also super quiet and melodic, and/or very complex and mathematical… I’m using a lot of very different dynamics, and can play pianississimo with fingers, to super loud. So I’m trying to also have a wide range of dynamics with electronics, to be able to adapt my type of electronic sounds to my drumming. The way I put effects on the drums allows me to have this range of dynamics, but even with these tools, I put almost no effects on the drums when I play really loudly. In these loud moments, I’m rather triggering synths, like the OCS-2 from Nozoid, which allows me to still have interesting textures with a big acoustic sound. This question of dynamic range also arises from the fact that I sometimes perform with theater artists who are not necessarily amplified. The audience has to understand what is being said, so I had to find techniques to do something interesting without destroying the text. In addition, I‘m increasingly taking into account the architecture & acoustics of venues. Sometimes, when you’re performing in big halls like the Palais de Tokyo, you have to find a way to be fully understood, and it has a huge influence on how you play. I kind of like these uncomfortable situations that force me to find a way to make things circulate. Spatial sound is also something that you explore in your work. How does space influence sound, and what is your favourite space/place that you’ve played so far? I used to work a lot with spatial sound in performing arts, theater and contemporary puppet theater. I’ve just done an installation with 46 speakers above the audience, exploring very precise movements and small sources of sound. I very much like the granular sounds and spaces that you can create with such a system. But still, I think my favorite places were not using spatialization, but acoustic space, like for example the Gare du Nord, the biggest train station in Europe, a huge hall with thousands of people constantly passing through. I had the chance to play there and use this huge resonance chamber and that was an amazing experience. I also like very small venues, where the audience will hear the almost silent sounds. I kind of appreciate performing outside more and more. I was invited to perform in the desert in the emirate of Sharjah. This was an incredible experience because you feel so small compared to the elements around you. Even with a huge sound, you know that you are nothing. Is psychogeography and the emotional/mental aspect to music-making something that influences your work? Yes, depending on my different projects or collaborations. My language has been built like this, using a lot of mental images. In my most recent projects, I’ve been taking into account psychological/political contexts more, like the decolonization process, or the way time is increasingly fragmented, putting our minds in different psychological strata very quickly. I also like to explore the relation to time with regard to interaction with video or dance. You’re playing at the SHAPE x Nyege Nyege showcase in September. What are you preparing for the show and is the context of the festival and East African music scene in general something that you’re interested in? What are you currently working on and planning for the near future? My own projects are the performance called «We are Stellar», a duo with the visual artist & performer Mathieu Sanchez that we are going to perform at the end of September. I’ll be performing a solo piece for Thanks For Nothing / La Nuit Blanche in Paris. This solo, called «Under the same sky?», is a piece using recordings of refugees I met on the streets of Paris last year. I will also premiere a performance within the frame of FIAC with the hip hop dancer Entissar Al Hamdany. This will be a reflection on the meaning of the universal human rights declaration nowadays, 70 years after its formulation. We are also starting a new label with the co-founder of Demented records, Julien Haguenauer. I’m also releasing a record with the visual artist Taro Shinoda, Lunar Reflection Transmission Technique! It comes with original Shinoda Sensei paintings on each piece. I also have several commissions and collaborations coming up: I’m working on the sound identity of the visual communications of the Lafayette Anticipations foundation, three pieces for a Brass Quintet based on traditional Mongolian themes. I’m also composing music for a show of the Succursale 101 theater company which has its premiere in mid-October in Paris, for which I’m working with the cellist Gaspar Claus and the singer Maude Trutet aka Mood.